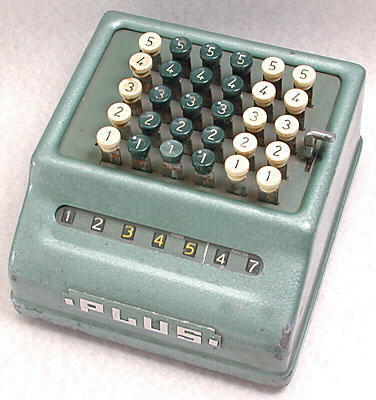 PLUS model 506/T time calculator. Hours and minutes, key-driven ("Comptometer") type, with abbreviated keyboard (only has keys 1 to 5). To enter a number greater than 5 two keys have to be pressed in succession in that column. 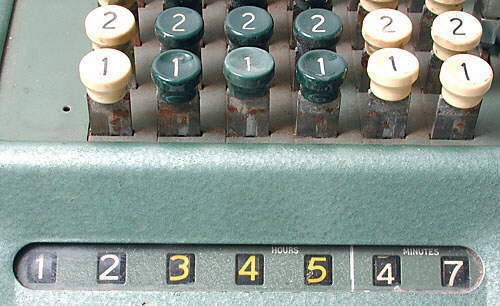 It is a model 506/T where the 5 denotes the abbreviated keyboard (keys up to 5), the 06 denotes the 6 columns of keys, and the T denotes a Time (hours and minutes) version. 170 mm x 190 mm x 118 mm. (6.7" x 7.5" x 4.6"). One of the more minimalist calculators made. Has 4 decades of hours keys, and 2 decades of minutes keys, with each decade numbered from 1 to 5. To enter a number between 6 and 9 two keys have to be pressed in succession in that column. The knob on the right is for clearing the total. 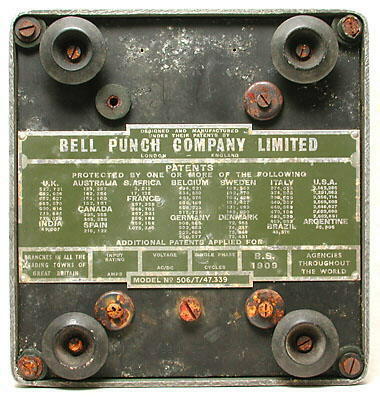 Made in England by Bell Punch Co. Ltd. 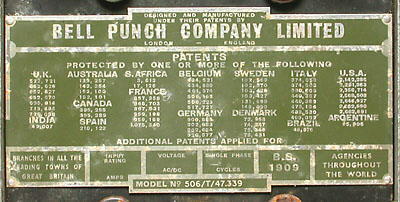 The machine illustrated has serial number 506/T/47.339, and has the older, rounded style casing. Time has not been metricated yet so this calculator could still be useful. Close up of the display, showing the total 12,345 hours 47 minutes. Capable really only of adding time up to 99,999 hours 59 minutes, but capable of doing this quickly and accurately (and cheaply !). In the days before electronic computers this machine would have been very useful in a company's wages department for calculating the hours worked by employees, so that their wages could be calculated.